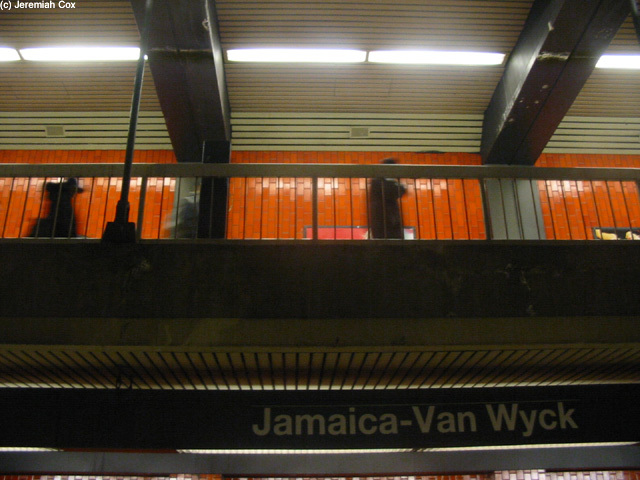 Jamaica-Van Wyck is one of the most unusual subway stations. 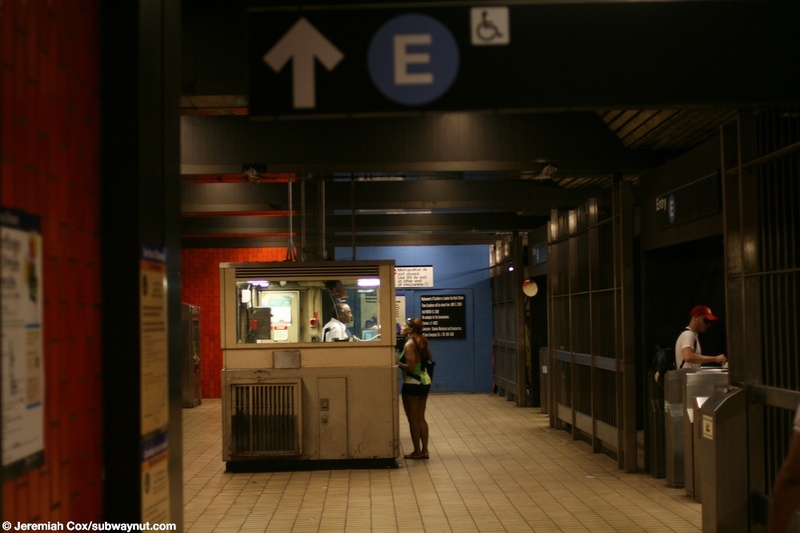 The main reason for this is it is part of the Archer Avenue extension that was only opened on December 11, 1988. The station is definitely a bit overbuilt, for most of the station there is a large double height ceiling that originally had glass allowing daylight to pour into the station along the wall eves along the Manhattan-bound platform, these though have been sealed allowing no natural light to come in. 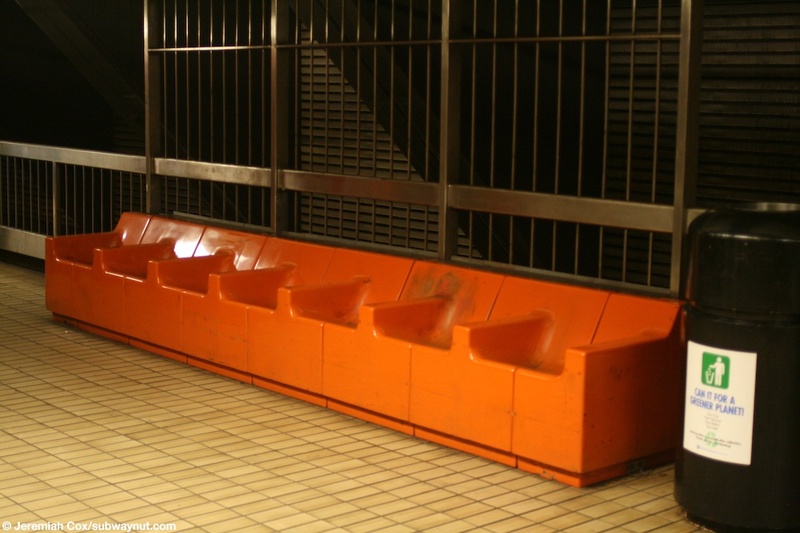 The station has one island platform and all walls are various shades of orange. 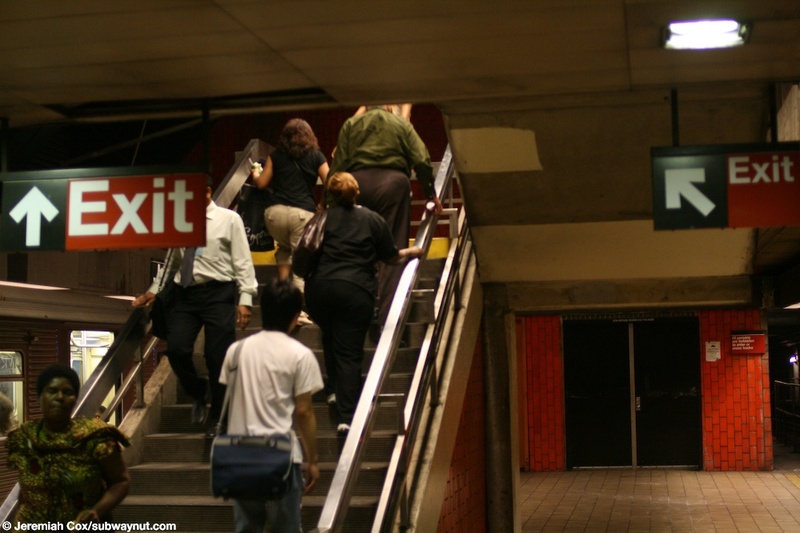 The exit is towards the Jamaica-bound end of the platform and fare control is on a balcony directly above the island platform that has a staircase, an two escalators and the ADA elevator down to the platform. There is a bank of turnstiles here that leads to the exits. 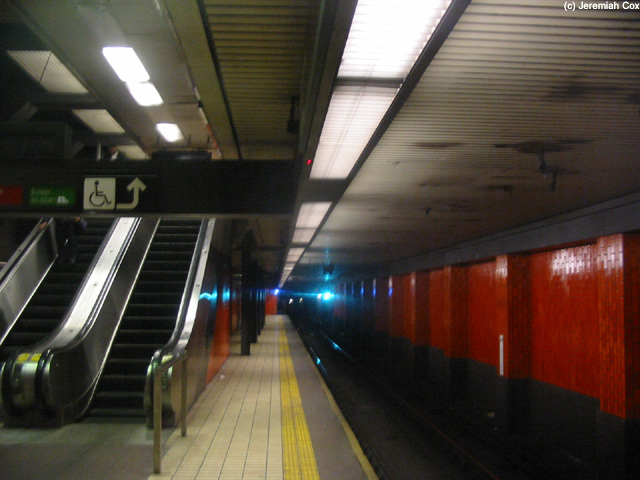 One of witch is through a passageway that is in an area beyond the station platform (as the tracks continue to Jamaica Center) this leads out to a mega-entrance in a building at street level with two escalators and a small staircaseas well as the street elevator to the SW corner of 89 Street and the Van Wyck Express next to the entrance to the Jamaica Hospital Medical Center. 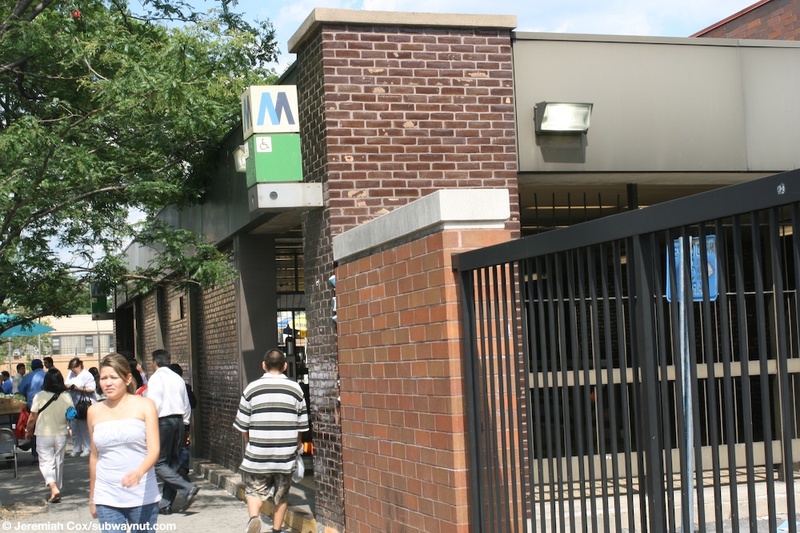 The other exit is particularly interesting because the walkway to it is cantilevered out from the station ceiling and walls above the Jamaica bound platform before the passageway turns to provide an exit to Jamaica Av-Metropolitan Av, with a single up only escalator and staircase to a small plaza triangle surrounded by/intersected with 135th St/Kew Gardens Road, Metropolitan Avenue, and Jamaica Avenue. and the Van Wyck Expressway Service Road. 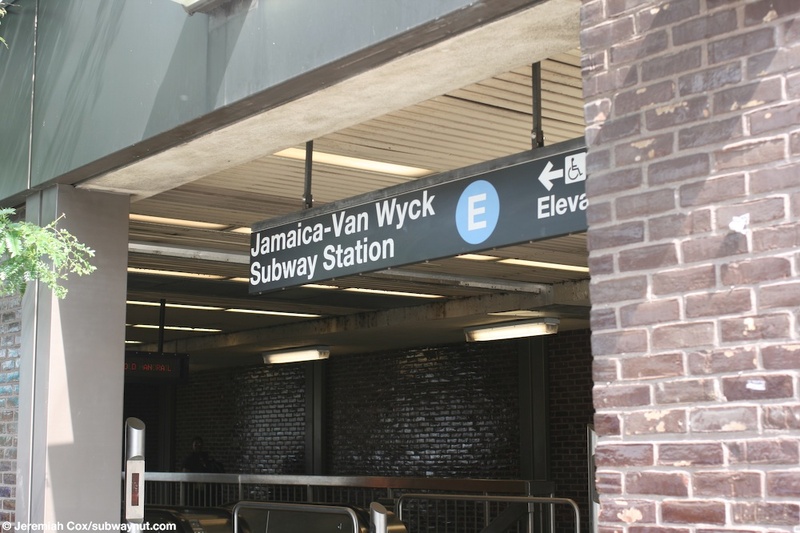 (vanwycke1) A sign for Jamaica-Van Wyck along the top of the island platform. The white with black stripes board telling the conductor that it is okay to open the doors is incorporated directly into the sign. 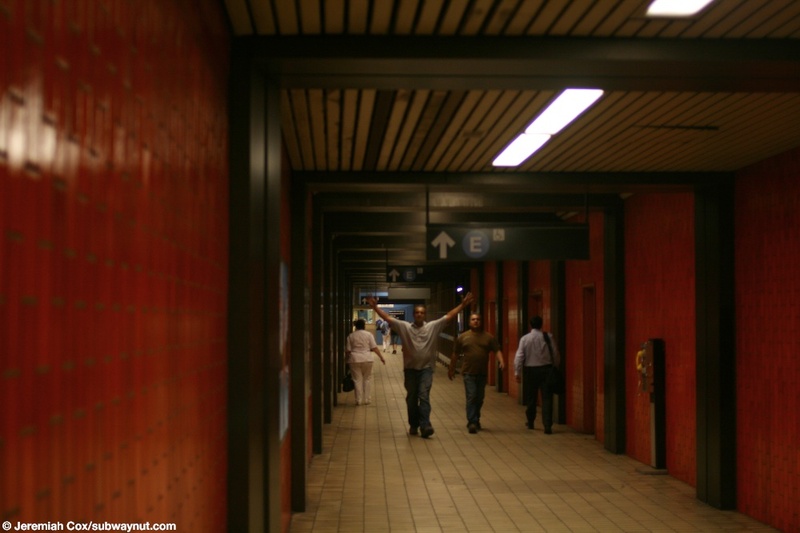 9 February, 2004 (vanwycke2) Passengers walk over the passageway that is cantilevered over the Jamaica-bound platform between the station's single fare control area and the exit to Jamaica Av-Metropolitan Av. 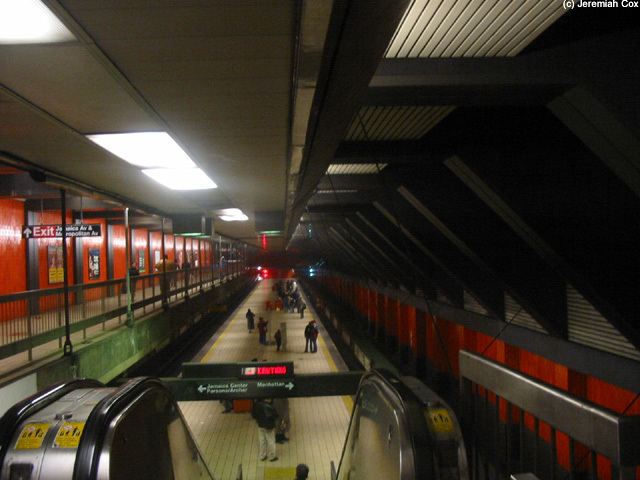 9 February, 2004 (vanwycke3) Looking down the island platform at Jamaica-Van Wyck by the escalators up to the mezzanine fare control area. 9 February, 2004 (vanwycke4) Looking down the island platform that has a very high cieling at Jamaica-Van Wyck from the top of the escalators on the mezzanine level. (vanwycke5) Looking up a very crowded staircase up to the mezzanine at Jamaica-Van Wyck. It is so crowded because of escalator refurbishment closing off the main bank of esclators between the mezzanine and the platform. 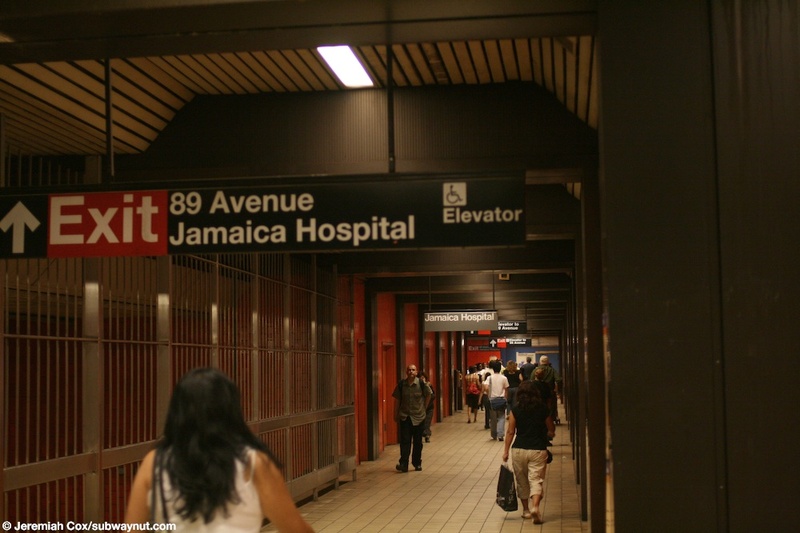 25 June, 2008 (vanwycke7) Looking down the relatively narrow corridor that leads from fare control to the Jamaica Hospital-89 Street exit at Jamaica-Van Wyck. 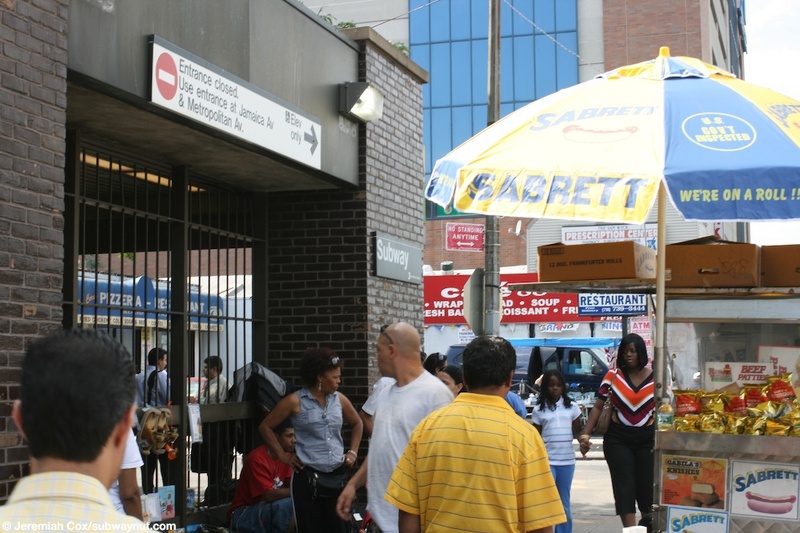 25 June, 2008 (vanwycke8) A side view of the structure surrounding the stairs, escalators and elevators at Jamaica Hospital-89 Street down to the subway station at Jamaica-Van Wyck. 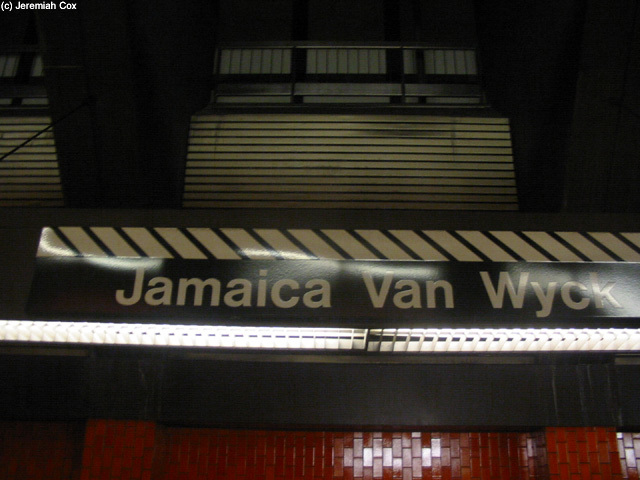 (vanwycke9) A close up of a sign at the entrance to the Jamaica-Van Wyck subway station. 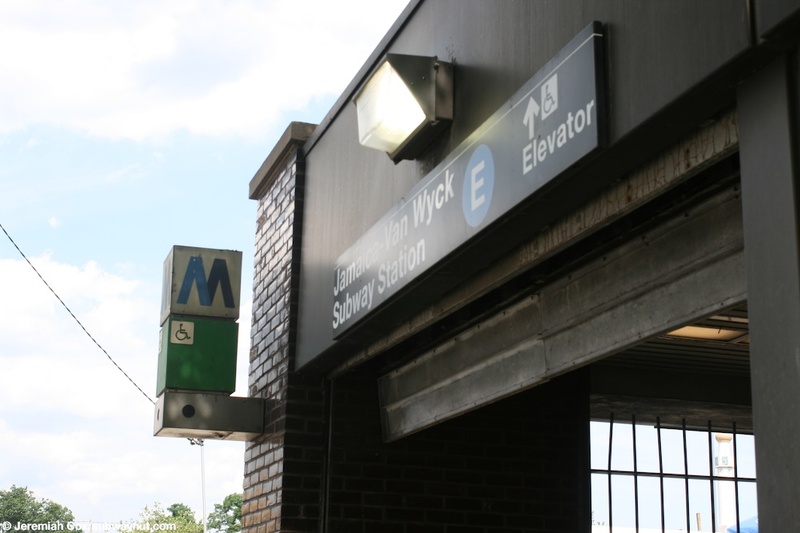 25 June, 2008 (vanwycke10) Another station sign at the entrance to Jamaica-Van Wyck station with the old M logo cubes that are green saying its an entrance that is always open and that also have the wheelchair logo on them saying its an accessible entrance. 25 June, 2008 (vanwycke11) A very busy Queens Blvd, with an entrance to the Jamaica-Van Wyck station with a sign saying that the entrance is open for elevator use only and to use the other entrance at Jamaica Av & Metropolitan Av, that sing is wrong this exit is currently the only one open and the other one has closed. 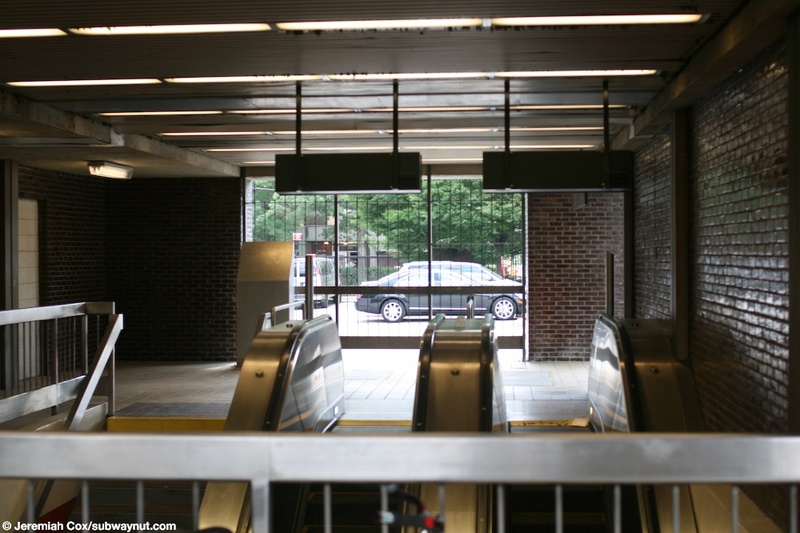 25 June, 2008 (vanwycke12) An interior view of the quite large structure at street level with escalators leading down to the mezzanine at Jamaica-Van Wyck. 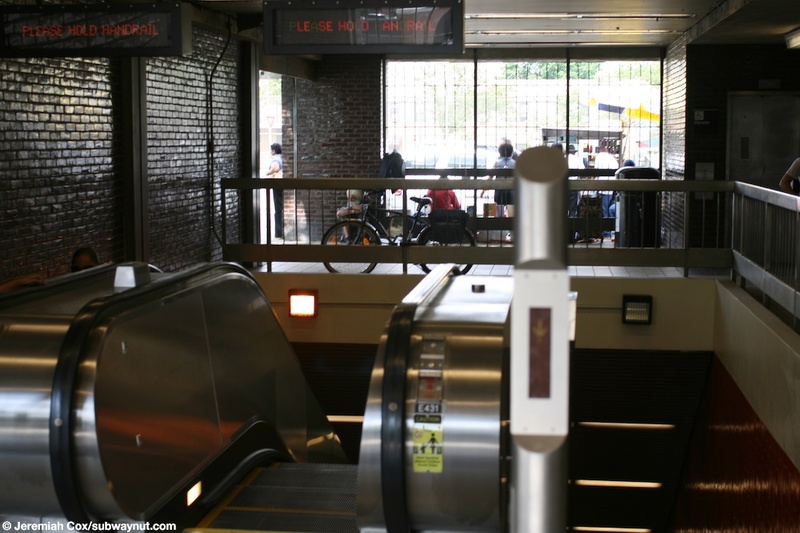 (vanwycke13) A view the front of the escalators down to the platforms at Jamaica-Van Wyck, these are definitely new because they have little posts right before them with LEDs on them that display an arrow that is going either up or down saying the direction of the escalator. 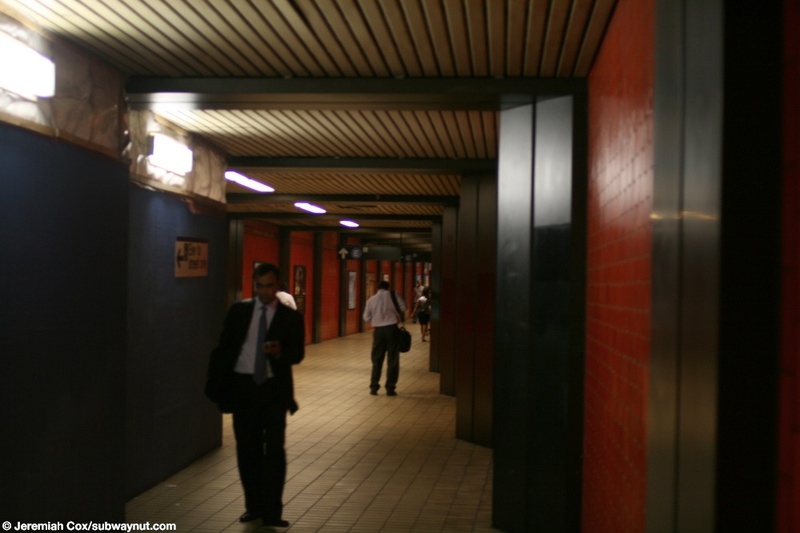 25 June, 2008 (vanwycke15) Another view down the corridor leading to the E train at Jamaica-Van Wyck.